The 1980s saw a notable decline in the park's prestige. Numerous residents wrote letters to the editor in the Times Picayune complaining about litter in the park; one letter was titled “Palmer Park Dump.” The most common complaints were about broken bottles throughout the park, especially in the sand areas where children played, and vagrancy; one article labeled the park as a “hotel for winos” and another describing the park as a place where the homeless slept every night. In September 1980 Nancy Shepard adopted the park through the Parks and Parkways Commission’s “Adopt an Area” Program; she noted her plan was to collect money to hire youth to clean up the park. City Councilman Bryan Wagner also became involved and organized park clean-ups and was able to secure the hiring of a full-time groundskeeper. He also passed through a city ordinance banning the drinking of alcohol in the park in 1984. In 1982 the Palmer Park Neighborhood Association was formed and listed as their top priority eliminating litter and crime in the park. Crime had become a larger problem in the park in the 80s. Numerous Times Picayune articles described armed robberies and violent assaults in Palmer. The park did continue to be the site of community gatherings like the annual Carrollton caroling, the inauguration ceremony for two state officials in 1988, and a 1988 “World Peace Through Race Unity” rally, but the area was more often described as a site of litter and crime than as a community space as it had been in earlier decades. Kevin McQueeney and Kathryn O'Dwyer, Editor, “Palmer Park During the 1980s,” New Orleans Historical, accessed April 24, 2019, https://neworleanshistorical.org/items/show/797. “Battery.” The Times Picayune July 21, 1983. “A Clean Park: Thank Councilman.” The Times Picayune February 14, 1981. “Community Cleans up Own Park.” The Times Picayune October 1, 1980. “Four Corners: Where Claiborne Meets Carrollton.” The Times Picayune June 27, 1982. “God Kept Him at the Corners, And Won’t Tell Him Why.” The Times Picayune September 20, 1981. “A Housing Comeback in Carrollton.” The Times Picayune April 17, 1982. “Inauguration Sunday for N.O. Lawmakers.” The Times Picayune March 2, 1988. “Ordinances.” The Times Picayune August 23, 1984. “Orleans Clubs.” The Times Picayune September 15, 1988. “Robberies.” The Times Picayune June 27, 1980. “Robberies.” The Times Picayune November 21, 1980. “Your Opinions: Palmer Park Dump.” The Times Picayune September 5, 1980. 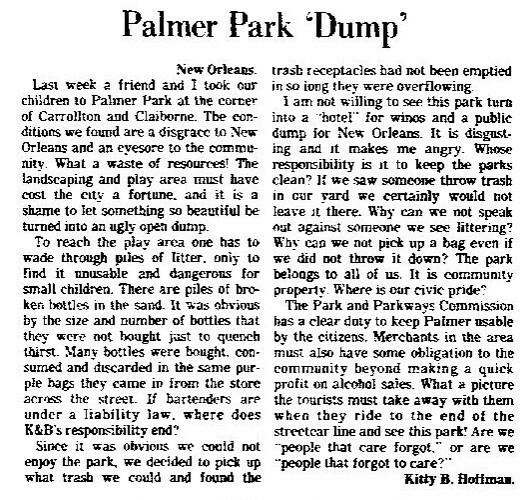 “Your Opinions: Palmer Park Litter.” The Times Picayune September 1, 1980. “Your Opinions: Palmer’s Adopted.” The Times Picayune September 15, 1980. “Your Opinions: Park Perks Up.” The Times Picayune March 25, 1981.